Since I happen to live about 25 miles away from the border, I have pretty easy access to any Mexican ingredient I could ever want. A trip to Northgate Gonzalez supermarket allowed me to pick up all the necessary tamale provisions, and a few fun impulse buys too. I even ended up buying a bag of pre-made masa dough, which definitely cut down on my work for the day. In the future, though, I found that I would rather make it from scratch. It’s really not very difficult, it’s more economical, and it allows the cook to control the ingredients. 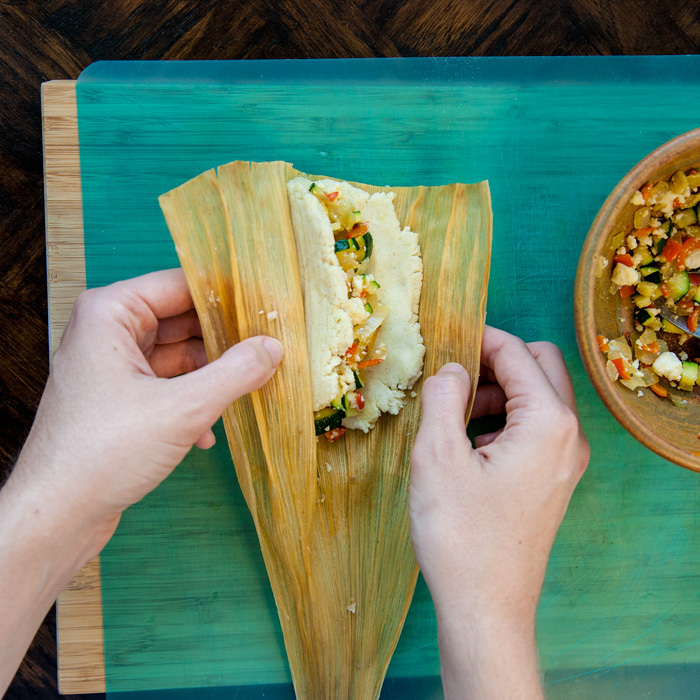 Making tamales is sort of a big production, but I think it’s perfect dinner party material. Last weekend I had a couple of friends over, and we treated it as our activity for the evening. Before they arrived, I soaked the corn husks, prepped some tasty fillings, and set everything up on the table along with some chips + guac and festive drinks. After a quick lesson, everyone gets to have fun folding up little packages of dinner while chatting and snacking. With Instant Pot (or another pressure cooker) it’s much easier to pull this off, because the cooking process is so much faster and totally hands-off. Cooking my batches took no more than 45 minutes from first button press to full natural release. With a traditional steamer, the masses may start to get restless during the 1.5+ hours the tamales will need to cook. But under pressure, once your batch is folded and loaded into the pot, just pour your guests another cocktail and dinner will be ready before you know it! For our fillings, I decided to offer both meaty and vegetarian options. The veggie filling was finely diced and sauteed zucchini, onion, and Anaheim pepper, mixed up with crumbled queso fresco (yum!). The meat was Smitten Kitchen’s southwestern pulled brisket, which was amazing, and I made it in Instant Pot, too! Only 70 minutes for perfectly tender brisket versus 8-10 hours in the original slow-cooker recipe! And if you’re going through the trouble to cook tamales, definitely make a huge batch, because they freeze flawlessly. We sent our friends home with leftovers to enjoy, and we stowed away a big bag in our freezer too. While the pressure cooker was going, I sauteed a simple side of extra veggies, to create a semblance of nutritional balance. 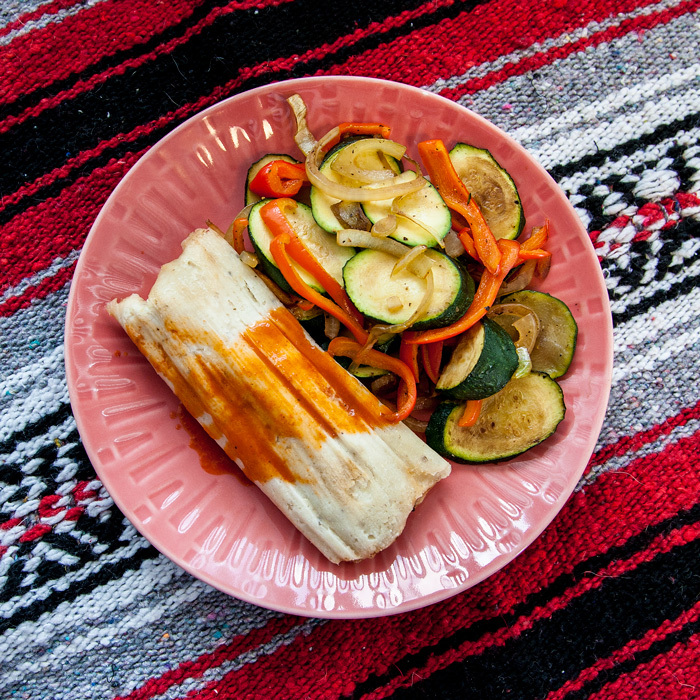 Tamales aren’t exactly the poster child for healthy Mexican food, but they’re so homey and satisfying, and we only celebrate Cinco de Mayo but once a year! Don’t miss my next post, in which I share the perfect make-ahead dessert for your Cinco de Mayo festivities! What kind of Mexican cuisine are you most excited to cook/eat? Technique adapted from Hip Pressure Cooking. The purpose of this recipe is to create simple instructions specific to Instant Pot. I have glossed over most of the prep work, and focused here on the cooking procedure. For specific ingredient quantities and instructions, as well as more general guidelines for other pressure cookers, see the original version. Prepare and fold your tamales according to the cited recipe. Pour the water into Instant Pot, and insert the steamer rack. Arrange the tamales, open-side-up, vertically in the Instant Pot. Lean them against the sides of the pot and prop them up against each other to maximize your capacity, but leave a small amount of empty space to ensure that the pot will properly pressurize. Close the lid and set the vent to sealing position. Press "Manual" and adjust the time to 20 minutes. Let the tamales come to pressure and cook. When the timer rings after cooking, press "Cancel" and wait for the pressure indicator to release naturally before serving. Rose, Mary is not entirely incorrect. In the USA, we (although technically incorrect) celebrate May 5 as Mexican Independence Day. – Probably because “Cinco de May” is easier than “Diez y seis de Septiembre” LOL! September 16, 1810 is considered the beginning of the Mexican War of Independence. Since October 1825, the anniversary of the event is celebrated as Mexican Independence Day. However, 5 de May is the date observed to commemorate the Mexican Army’s unlikely victory over French forces at the Battle of Puebla on May 5, 1862. So, technically there are two. Tamale size is what really counts – if you prefer yours larger or smaller than these, I would adjust the time up or down by a few minutes to match. 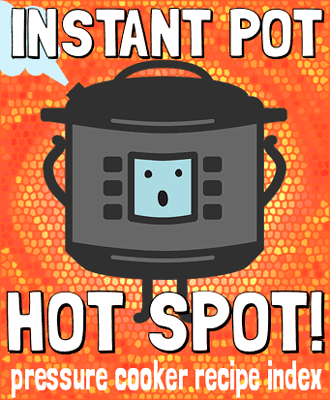 Did you use the low pressure or high pressure setting on instant pot? 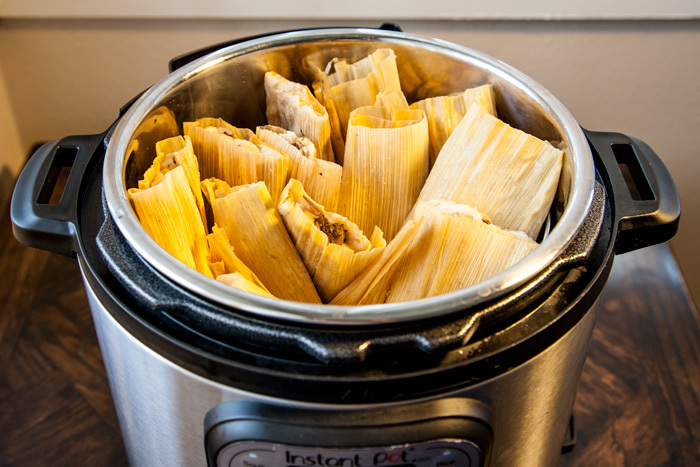 What size instant pot did you use and how many tamales did you cook at one time? I have a 6-quart model – I wish I remembered to write down how many I cooked at once, but I think it was ~15. Can I cook frozen tamales in the insta pot too? How long should I cook for? What is the best way to reheat leftover tamales that have been frozen? Can that be done in an instant pot? Maybe, but I haven’t tried it myself. I usually just reheat frozen ones in a microwave. Hello, I tried steaming in the IP and it was a fail. The masa came out watery post 25min added 10min with same result on high pressure. I’m not sure where I went wrong, the only thing I can think of is I quick released instead of natural release?? I’m afraid to try again so much hard work lost! Always such a bummer to get poor results on such a time-consuming dish! Did you use purchased masa dough, or mix up your own? Do you think the dough had too much liquid to begin with? Thank you for your reply! masa was homemade and not too moist actually after all the time in the IP it actually became more watery. Do you usually leave room in the IP? I packed mine with tamales didnt double layer but completely filled and not sure if that’s what contributed. That sounds like it could be part of the problem – just like in a conventional steamer, the bit of space around the food leaves room for the hot steam to circulate and cook evenly. You can load a lot of tamales propped up vertically, but pack loosely enough to allow air flow. Hi ! You say cook times : 45 min but I read your instructions, and it states 20 min? Is it 20 min or 45 min? We have a six quart instant pot. Put a cup and a half of water in it. The water was all gone at the release, and the bottom of the instant pot was scorched. Did 20 min manual. Any ideas what went wrong? I have to admit, this one is baffling to me! I have steamed things with 1 cup of water for much longer and never had problems – I would think, under pressure, there’s nowhere for the water to go… anybody else have any ideas?? Edit: PS: Could the valve have been partly open? This happened to me the two times I’ve made them. After reading I think I packed too many tamales in the pot. Hi Mary I want to know if you can steam tamales that you get from a tamale store. They have been steamed so you wouldn’t cook them again. Could you steam them again. Tried cooking tamales twice in instant pot. It does not work. 60 minutes first time and over 90 the second time I made them. Save yourself the frustration and do it the old fashion way. Sorry to hear you had so much trouble – what was it that didn’t work? The masa didn’t cook through? Do you think the pot could have been packed too tightly? The ratio of corn masa flour, fat or lard, and water is critical. According to my grandma (c. 1959-1960), the water and fat content in the tamale masa must be balanced. Too little water or fat in the final masa mix and the masa will absorb the needed water to cook properly from the surrounding steam “bath.” As she said, that is why boiling hot water was added when being steamed the old fashioned way when the pot “ran”dry. I steamed mine in IP for 20 minutes after pressure came up.. they came out perfect.. Maybe to long?? Sue, were you reheating tamales? If so, you actually used the “Steam” function rather than pressure, is that correct? I was planning on reheating using the Steam function for about 25 minutes. Thanks! Mine turned out perfect, 2 cups of water though and 20min at high pressure. PLEASE LET YOUR TAMALES Rest after they cook, they take 20 mins out of the instant Pot to firm up, cooking them longer will not firm them up but only make them runny. Heather D. Thank you for your final tip. Mine are cooking at this very moment and reading these fails is like having a bad dream just hoping I wake up. I already plan on bragging If i am successful at this tonight .. but even more importantly I just want to indulge in my hard work.. yum.. wish me luck every one. Fingers crossed. 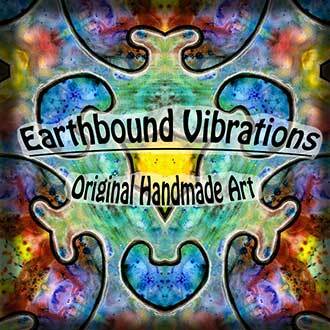 Making them right now! I made them for Cinco de Mayo in the IP and they were perfect. Let’s see how these do! Just got the IP this Christmas (2018) I don’t understand the Pot’s instructions. But I’m doing Tamales as my first cook in IP. ..1. I thought if I choose “steam,” I’d be cooking them the same ol way just wouldnt have to worry about running out of water. 2..not so, so now i see that it’s “on” & “normal”, I guess its building pressure. Sweet Jesus, I’m seeing this through.